Your energy bill is a necessary expense, but you can lower it with just a few minor changes. One major key to energy savings is your thermostat. Your thermostat settings play a big part in keeping your HVAC system running as efficiently as possible. You should always have your thermostat checked yearly as part of your regular maintenance schedule in order to keep your system running at peak performance and prevent expensive AC repair in Reidsville. 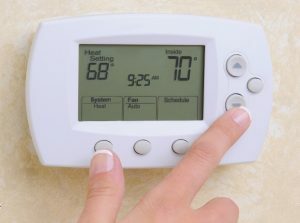 What are the Recommended Thermostat Settings for Heating and Cooling? Ideal temperature settings are highly subjective and often the source of debate in many homes. Some prefer warmer temperatures and others prefer cooler temperatures. Finding an ideal setting for everyone in the family is difficult. But focusing on the best temperature for energy-savings rather than personal preference simplifies things. During the winter when your furnace is running, the optimal temperature setting is 68 degrees Fahrenheit. The closer you set the temperature to the outside air, the less your furnace will have to work to heat your home. The same concept applies to your air conditioner in the summer. The ideal setting for your AC in hot weather is 78 degrees Fahrenheit, which is closer to the outdoor temperature while still feeling comfortable inside. This is the recommendation set forth by Energy Star, a joint federal program run by the Department of Energy and the Environmental Protection Agency. Technology continues to improve when it comes to HVAC systems, and one of the best innovations is the programmable thermostat. It gives you the ability to program a variety of different temperature settings for different times of the day. In the warm weather months, you can program your thermostat to raise the temperature while you are gone and lower it before you come home, saving energy that is unnecessarily wasted to cool an empty house. In cold weather you can do just the opposite, allowing your home to cool down while you are gone and warm up before you get home. And you can lower the temperature at night while you’re under the covers and set it to warm up just in time for you to get up in the morning. Once you program your thermostat, you can forget about it. But what if you need to make a change and you’re not at home? There are now smart thermostats that can be controlled remotely from your phone or other device. Say you’re out of town and expected to be home on a certain day, but plans change and you won’t be home when you originally thought. Simply change your thermostat settings from wherever you are. If you’re ready to experience optimal HVAC performance and energy savings, have the experts at Carolina Fuels install a programmable thermostat in your home. A new thermostat combined with yearly maintenance for your air conditioner and furnace ensures that your entire central air system will perform at its best all year. Call Carolina Fuels at (336) 623-9741 to schedule a thermostat replacement, maintenance appointment, or AC repair in Reidsville and start saving money on your energy bill.